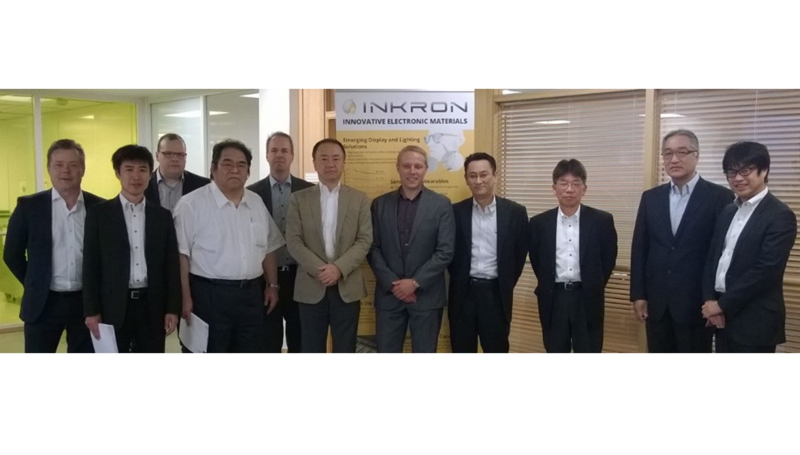 Hong Kong/Helsinki - 8 September, 2016: NAGASE Group as NAGASE & CO., LTD. and Nagase ChemteX Corporation (herein after jointly called NAGASE Group) today announced a move to expand its relationship with Inkron Limited, by the acquisition of a minority stake in Inkron Limited. At the same time, the Companies agree on extensive global collaboration in commercialization and distribution of Inkron’s technology and products. This move is expected to accelerate Inkron’s technology and product penetration into the global electronic and semiconductor markets while providing NAGASE Group with access to new siloxane based chemical solutions. This new agreement is a natural progression from the Development and Manufacturing collaboration the parties started earlier this year, concentrating on the areas of OLED and on-cell touch sensor materials. The partnership builds on the strengths of Inkron’s technology leadership in siloxane and nanoparticle based optical and electronic materials, and NAGASE Group’s global reach in specialty chemical sales-and-marketing distribution network. “We are delighted with the opportunity to work closely with Inkron, through recognizing the synergies between Inkron’s siloxane technology development and NAGASE’s commercialization and manufacturing strengths, we can unveil new market opportunities and technological possibilities for us both. As unique material needs arise with the OLED and flexible display framework, we see Inkron’s advanced IOC, IDA and ILE products addressing exceptional market demands from our partners. These technologies offer solutions which are complementary with our current market offerings and technology, and are also well suited to the volume manufacturing capabilities at our facilities“: explains President Mr. Akihiko Isono of Nagase ChemteX Corporation, and General Manager Mr Takahiro Okumura, Electronic Chemicals Department of NAGASE & CO., LTD.
Inkron is a technology leader and manufacturer of next generation materials for the Displays, LED, Power IC, semiconductor and printed electronics industries. Inkron’s proprietary advanced siloxane polymer chemistry capabilities, along with cost effective and distributive processing technologies for nanomaterials, enable the development of a wide range of customized material products with superior performance advantages in high-tech applications. For more information on Inkron, please visit www.inkron.com. Manager of Electronic Chemicals Dept.